Not all stores make a lot of generic toothpaste, but we got a hot tip that CVS has a generic Sensodyne. It turns out, they have many different varieties of Sensodyne and the generics to compete. We picked up the Extra Whitening version, and plan to test others in the future. 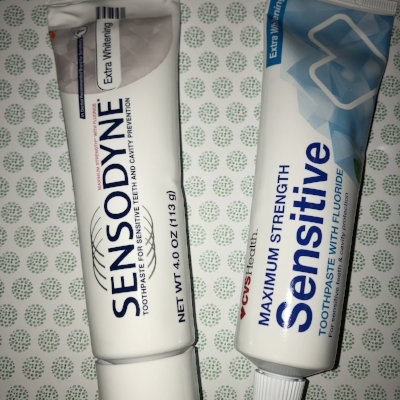 At first comparison, the Sensodyne seemed to be a little more watery than CVShealth. We did dispose of the initial squeeze to see if this would reduce the watery-ness of it. That did the trick. So, for visual and consistency, the products seemed to be the same. When we smelled and tasted each, it was clear that the Sensodyne toothpaste had more mint. We brushed our teeth with one, then waited until after another meal to brush the teeth again. Both toothpastes left our teeth feeling smooth and clean, but the Sensodyne left the mouth mintier and thus fresher feeling. After an ingredient comparison, we found the active ingredients to be very similar, but the inactive to be fairly different. We believe the similar active ingredients still make this worth the switch. Over time we will study the whitening effects of both brands. Keep smiling, my friends.